We will be closing MyWellbeing Dame St on 29th June. All classes purchased must be used by this time! All exercise classes from 6 weeks and bring your baby!! Massage suitable from 2 weeks and may be refundable from your health insurance. Join us in our Mum and Baby, family friendly haven on Dame St, Dublin 2. On the ground floor, just off Dame St we have buggy storage, and our custom built studio on the first floor is bright, airy and full of love waiting to welcome you and your baby! Thursdays 14.30. This is a MUST for new mums. We love to see mums from 6 weeks postnatal until your baby begins to crawl! Mum & Baby Yogalates is a one hour class designed for Post Natal Recovery focusing on restoring the health and wellbeing of a new mum. In this class expect a workout to strengthen our postnatal bodies. We will teach you with specific exercises aimed at re-balancing our pelvis and wrapping our muscles back nice and tight. Once you know these exercises you can continue your postnatal recovery at home with the tools you will learn in our classes each week. Along with this, learn breathing and relaxation techniques for mental wellbeing as we train you in the very best techniques for self care after you have welcomed your baby. Join us to stretch and soothe both mummies and babies. The class is primarily baby led, as in every class mummy has to respond to her babies changing demands. Feeding, sleeping, poohing and puking all acceptable baby behaviours in class. Come join us NOW, no previous experience necessary and nothing needed just you and your baby!!! 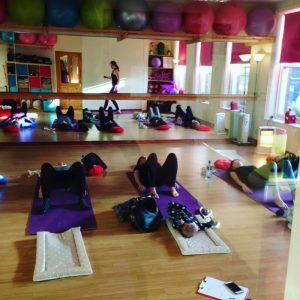 Classes focus on your postnatal health and recovery, by strengthening your body through Pilates based exercises and restorative breath work. We use light equipment for extra stretch and tone! We use calming, stress management breathing and relaxation techniques. You can bring your baby to class or escape alone! All babies welcome up to crawling. There are no baby exercises in this post natal class, this is all about Mums Health and Wellbeing!!! Join us in our Mum and Baby, family friendly haven on Dame St, Dublin 2. On the ground floor, just off Dame St we have buggy storage, and our custom built studio on the first floor is bright, airy and full of love waiting to welcome you and your baby! Join us for 5 Week Baby Massage Course in Crumlin on Wednesday 4th July at 11 AM. Our baby friendly studio on Crumlin, has a relaxed, supportive environment where you can meet other mums. Enjoy bonding and playing with your baby. Learn how to help relieve wind, colic and reflux. Chat to other new mums. We are registered with IAIM so your course fee will be refundable from your health care provider, please check with them in advance. Plus, everyone who books a Baby Massage course with us receives a FREE VOUCHER to try one of our other Post Natal Classes – Mum & Baby Yogalates or Post Natal Pilates. This course is open to Mums or Dads and babies from 2 weeks until crawling! This Baby Massage Training Course, if packed full of love. You and your baby will receive certification on completion on your course.